Miss Philippines Pia Alonzo Wurtzbach is this year’s winner of the Miss Universe pageant contest, but for one brief moment on December 20, it appeared as if it might be a repeat win for Colombia. 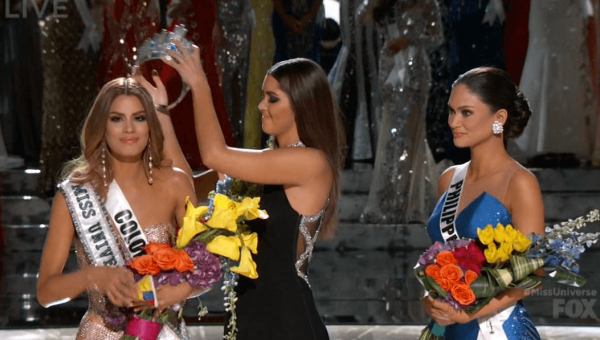 Miss Colombia Ariadna Gutierrez Arevalo was already wearing the crown as this year’s Miss Universe winner when host Steve Harvey returned to apologize. Steve Harvey said it was his mistake and that he would take responsibility for not correctly reading the card, which said that Pia Alonzo Wurtzbach was this year’s winner and Colombia was actually the first runner-up. The host held up the card for Fox network cameras to see up close afterward. Talking with reporters afterward, Steve Harvey and an executive for pageant owner WME-IMG called it human error. A mystified Miss Philippines Pia Alonzo Wurtzbach appeared stunned as she walked to the front of the stage alongside the crown-wearing Ariadna Gutierrez Arevalo before last year’s Miss Universe from Colombia removed the crown and placed it on Wurtzbach’s head. Pia Alonzo Wurtzbach later said she felt conflicting emotions as the mistake happened: joy when she was told she had indeed won, concern for Colombia contestant Ariadna Gutierrez Aravelo and confusion at the whole situation. Steve Harvey also apologized on Twitter, but at first misspelled the home countries of both contestants before also fixing that. “I’d like to apologize wholeheartedly to Miss Colombia & Miss Philippines for my huge mistake,” he wrote. Steve Harvey, who was hosting the contest for the first time, said he re-read the card and noticed it said “first runner-up” next to the Colombia contestant’s name before he asked producers if he had made a mistake. An executive with pageant owner WME-IMG, Mark Shapiro, said Steve Harvey caught the mistake and corrected it on his own, saying he wanted to make a wrong into a right. As all this was unfolding, a car drove up onto a sidewalk and struck dozens of people just outside the Planet Hollywood hotel-casino where the pageant was taking place. The Las Vegas Strip was soon jammed with ambulances and fire trucks, and authorities said 37 people were taken to a hospital to be treated for injuries and one person was killed. The competition started with women representing 80 countries between the ages of 19 and 27. For the first time, viewers at home weighed in, with their votes being tallied in addition to four in-person celebrity judges. Shortly after Sunday night’s confusion, Colombian President Juan Manuel Santos tweeted a message on his official account to Ariadna Gutierrez Arevalo. It is the third time a contestant from the Philippines has won the title. It could have been the second win in a row for Colombia. Miss USA Olivia Jordan was named second runner-up.